Parking break wire for back up camera? 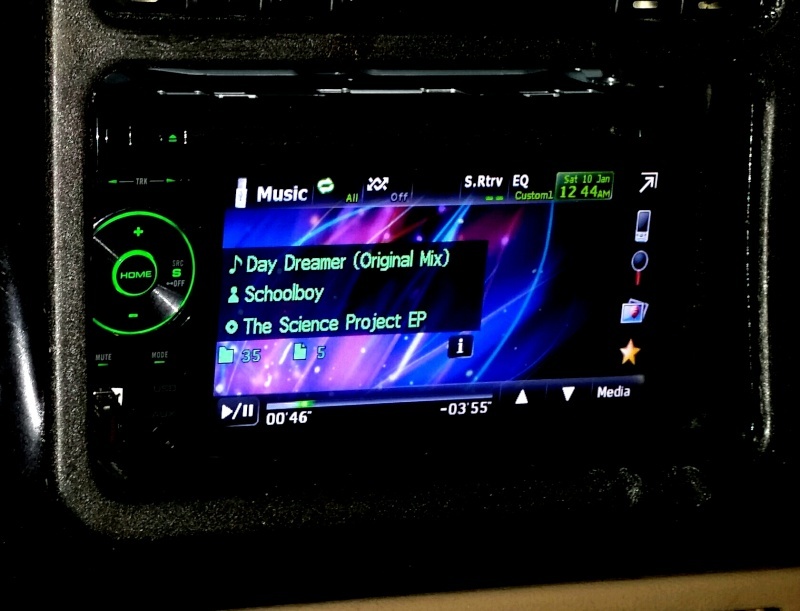 I recently bought a Pioneer AVH-P3400bh off of creigslist for cheep. The problem is bluetooth functions don't work properly, and the head unit keeps telling me that I can't use it while in a moving vehicle, which means I need to wire in the parking break to solve at least one of those problems. But I read somewhere online that my bluetooth won't work without being hooked up to the parking break. So, how would I hook up the head unit to think my transmission is like, never in park? because I don't wanna have to look at annoying attention screens, like ever. It's not like I'm gunna be watching DVD movies while driving, but it would be a lot more convenient overall if those annoying messages never show up. Any ideas on how to get parking break hooked up to it, like a back up camera uses but make it think the circuit is always engaged, so I don't have to see annoying notices while I'm driving which are very distracting when I just wanna pick my song and drive? You can either get a relay and do it the old fashioned way (12v switched power activates relay, grounds the parking brake wire), or you can buy one of the micro-bypasses on eBay or Amazon. These are the better option because there's less wiring and they fit very well in the tight space that we have. Some headunits let you just ground the parking brake wire and leave it like that, but most newer/namebrand stuff doesn't let you. Alternatively, you can just get a physical switch connect one end to ground and the other to parking brake, and flick it everytime instead of using the micro-bypass, but who wants to do that? Not to mention that some insurance companies won't pay out if you wreck with a relay/switch. This is why I like the micro because if you wrap the whole wiring harness in electric tape like I do (makes it much easier to manage) you can hide it under the electric tape and no one will ever know. I have no idea how to set it up on my head unit though. What wires do I hook up to the pioneer harness and what color wires I need to hook up to what. As of right now my head unit is only hooked up to ground, 12 volt power and the remote is hooked up to my car lighter socket cause I could never make sense of the harness diagram. So yeah not really sure how to fool the head unit into thinking the parking break circuit is always on because I don't even know what wires are what or what device other than relay helps or even how to hook up said relay or whatever else device. It should just be matching the colors on the 2 harnesses (Pioneer harness, GM adapter harness). The long, light green wire on the Pioneer harness is the parking brake wire. It needs to be grounded in order to bypass the parking bake, but Pioneer only allows the bypass if the ground is made after the ignition is turned on. This is the bypass me and my friends used. Works great. Subject: Re: Parking break wire for back up camera? » Ive removed my wiring and I dont know how to wire it back up.